All the things I enjoy doing, taking bits off, wiring, rubbing down, prep for the paintwork, painting and putting things back on, these have all been done this weekend, but not on the car. I have been promising the better half I would decorate the utility room for her after a few months that are getting on for a year or so, she has been patient. Since I have had the Mustang that part of the house has had little care, ok none really from me. But, I have put up shelves, fitted base units, fitted a sink and tiled around the sink. Other than that it has sort of stopped there as other more important things have taken over. This weekend that excuse didn’t wash, so I have kept my very late promise and decorated the utility room. To be fair it now looks pretty good again and she is happy with it. I have to score as many brownie points as possible at the moment as I will be spending a bit of time away working on the car when it gets to Mustang Maniac. Hey, I have even retrained myself from bidding on some Snap-On tools from Ebay this weekend. During the process of the decorating we have had some funny moments together doing it. But I should point out there are a few invaluable tips I have for you here when decorating with the wife or partner. Tip 1: Once you have disconnected the washing machine from the sink and the wife asks “Can I pour this down here”, you should go and check what she means – I thought she ment pour water onto the floor to clean behind the washing machine. So I said yes without checking. The next thing is that bowl of water was now squirting out under pressure from the sink onto the floor, I had to jam my finger in the hole to allow the water the water down the outlet. That was my fault because I said yes she could pour it down there! Tip 2: Once you have painted a wall and the part behind the washing machine needs to cleaned (again) let the wife know that the wall where she is kneeling is wet. The fact I had a smudged imprint of her a**e on the wall, and that the pair of trousers she was wearing now has paint on backside of them was all my fault because I didn’t tell her I had painted that bit! Tip 3: When the wife holds a torch for you to do some wiring after all the electric has been turned off, make sure you tell her that the torch is for your benefit in order for you to see what you are doing – not for her to see what you are doing. That was my fault because I should of told her where to hold the light! I did have a few ideas at the time, but the torch is metal and she was holding it at the time, if you get me. Tip 4: When you turn the electrics back on and you want to check the switches out for safety, tell the wife not to turn the lights on and off in the next room as you are still looking at said new switches you have just wired up. That was my fault again, as the electrics were back on it should of have been OK, and there was no need for me to jump like that. Tip 5: Tell the wife to go out and treat herself shopping while you get on with it. These tips will save time, grief and bewilderment at how it could have been your fault. On top of that, decorating can be done in half the time and multiple coats of touch up paint are then not required! Still it was good fun though even though I got the blame for all the little issues. How does she do it? The wife is a highly intelligent woman, but she has no common sense what so ever, she will admit that too. Still, Tip five is the winner and if possible skip Tips one to four, then when she comes back and all the work is done – brownie points in the bag! Unless I get paint on her clothes then I will have to make up for it and the huge hoard of brownie points diminished into a not so big hoard after all. Thanks to the wife for helping me in her own little way. However, if this post suddenly changes over the next couple of days then you know that the brownie points have been rescinded, and I am now sleeping in the man cave for mentioning the decorating tips for husbands. That also means she will have read this post too. I did manage to get out and do some work on the car, I drained the water/antifreeze from the engine and the radiator. This should make it little less messy when trying to get the engine out and disconnecting pipework etc. The Radiator shroud has been been removed and stored safely in the man cave now. There wasn’t much call for the photo opportunities of the process as pulling a pipe of the bottom of the rad is hardly exciting. Beside the way the weekend has been going I would have taken a photo and dropped the camera in the antifreeze. Perhaps I could try and blame the wife if I had of done that. There again perhaps not. I still have the rear section of wiring loom to remove which shouldn’t take to long. With any luck I will get round to it next weekend and put it with the main loom stored with the car in it’s own storage box. Looking down to the bottom pipe of the radiator. I also received a a very late Christmas gift this weekend after it has been on order for two months. 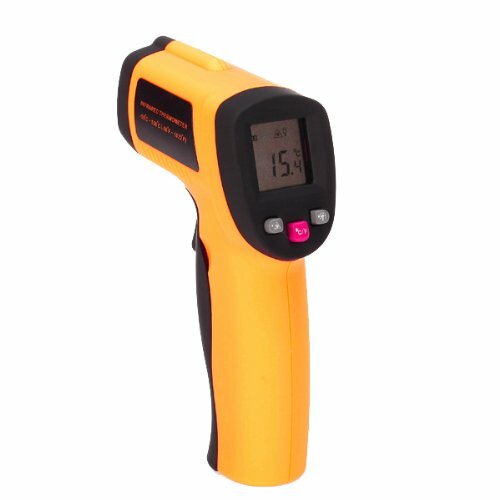 Its a GM550 Non-Contact IR-Infrared Digital Thermometer. I was after this to check for cold spots and hot spots of the car when it was running. But I have measured the toaster, kettle, radiators in the house drafts from doors – in fact everything I can point it at. It’s nothing to the with the fact it looks like a gun and fires a tiny red laser beam dot. I will get round to doing a review of it at a later date, I will probably need a new battery by then. This entry was posted in Car, General and tagged anti freeze, decorating, GM550, hose, Mustang, wire loom. Bookmark the permalink. Sounds like you had a fun and productive weekend. Those tips are vital for the family home dynamic! Lol. Essential tips for man / woman harmony. I hate decorating at the best of times, but for some reason I didn’t mind it last weekend. Favorite tip is #3. I must admit…I’ve been guilty of this a time a two, but I honestly think it’s because we mindfully sophisticated gals think we might want to add our hints and advice while holding the torch, you know…to be useful! 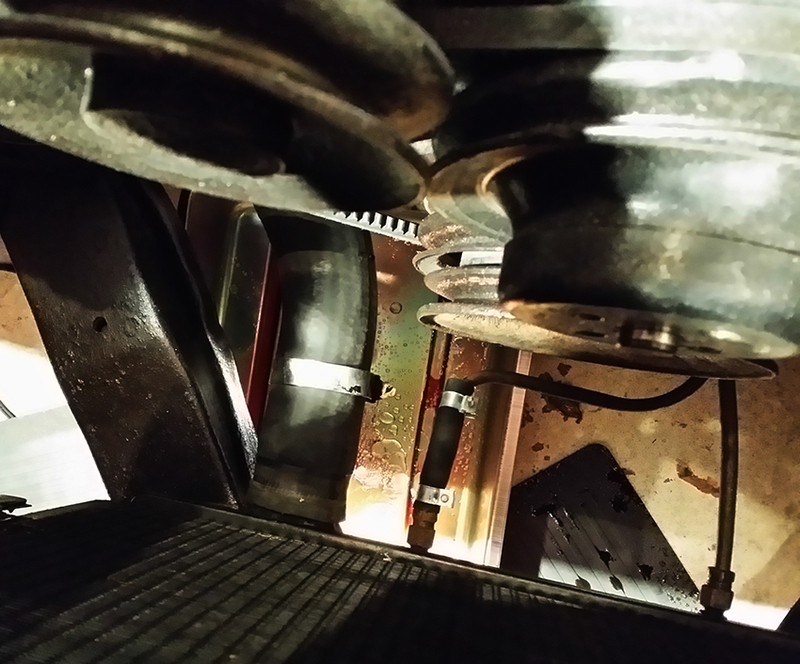 Great post as usual…also…Spring is coming and that means more time to tinker on the car!! Can’t wait. Hi Debbie, thank you. We did have a laugh and we just sort of went with it instead of stressing. When the water was gushing out the look on her face was a picture. That sort of set the tone for rhe day. Looking forward to the decent weather I must say, I can’t ger much done at the moment. Lol. I suspect the man cave awaits. But even so it was funny. I have thoroughly enjoyed reading that, I don’t feel so bad now. How these women manage to turn it around is amazing. These intelligent women have it sussed. Lol.